A few months back Isle of Light started following me on Twitter, we then got into a conversation about my fave type of scented candle. As you'll know from my previous post on the Twig + Dot candle my go-to candles are usually zesty fruity ones. At that point Isle of Light didn't have anything to fit my nose needs but the lovely Keeleigh decided to take on my suggestion and create one.. how bloody cool is that?! Keeleigh is a candle creator from the Isle of Wight who, at the young and spritely age of 17, has decided to follow her dream and jump into the world of home crafted candles. 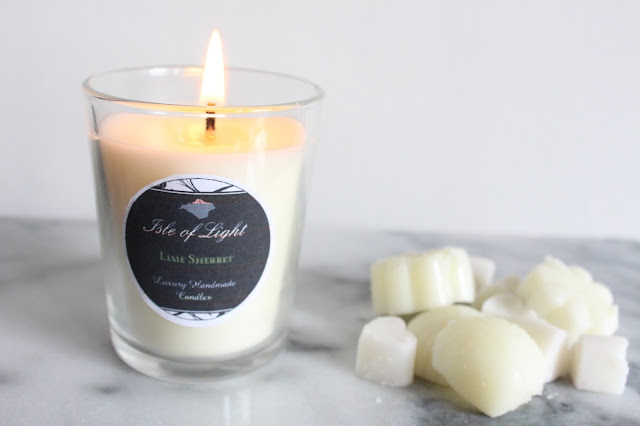 Isle of Light only use natural ingredients to hand pour their renewable soy candles. Of course once I saw that my suggestion had come to life in the form of 'Lime Sherbet' I thought it only right that I order one from her shop to try out and see whether it hit the zesty spot! As soon as I took this little beauty out of the packaging I could tell that Keeley had really gone to town with the lime- its SO fruity and divine. Before even lighting the candle my living room was already smelling sweet and mojito like! 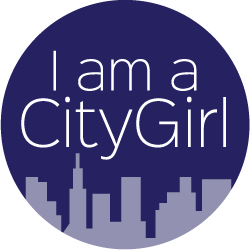 The small size (pictured above) is £5-you can also purchase this in medium and large. I do feel rather privileged to have inspired this candle creation and it 100% hits the spot for me. I've had great pleasure in adding it to my growing collection of candles that sit on-top of my little woodburner in the living room. I've had the candle burning for a good 10 hours so far and there is still more than half of the candle remaining- such good value for money! Even when this candle isn't lit it still manages to provide a really beautiful scent whenever I walk past it. Keeleigh also popped in some wax melts with my candle and OHH these are amazing.... I think I have a mixture of the different fragrances here which is great as I get to try out each one! I've been using these in my Ceramic Oil Burner from The BodyShop. 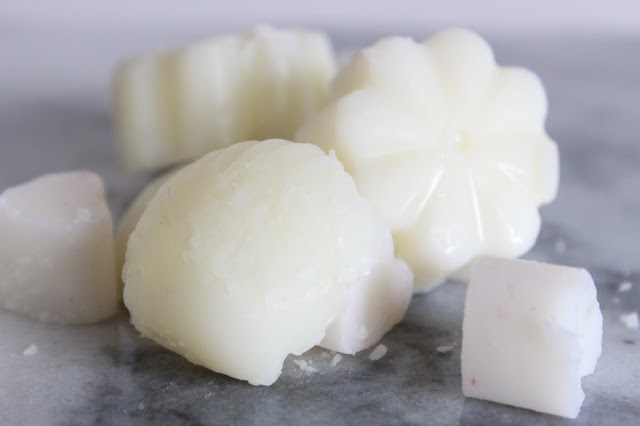 I'm much preferring these wax melts to the usual fragrance oil I've been using over the past few months as the scent seems to be a lot more intense and lasts a whole lot longer! Have you tried any Isle of Light products yet? Whats your fave type of candle scent? This scent sounds lovely, I'd never even think of that scent! Awesome that you had a candle made for your tastes! It sounds like a lovely scent too, I'm a sucker for scented candles.